Greek-style Lamb Burgers | Om nom nom! What can I say…this one may have become one of our absolute favorites! Hugely flavorful for not a lot of effort. 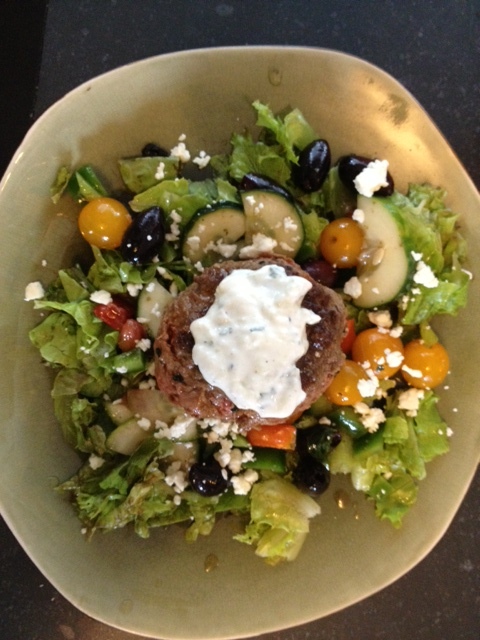 In my low-carb recipe idea search, I saw a pita-less gyro, and that gave me the idea to do a lamb burger over a Greek salad. We topped the burger with some not-quite-tzatziki and it was delicious. I used a Bon Appetit recipe for this, and made no changes. Great as-is. I kept the salad on the lower-cal side by cutting the oil substantially when I made the dressing. We definitely didn’t miss it. Mix first 4 ingredients and 1 1/2 tablespoons oil in medium bowl; mix in lamb. Shape into four 3/4-inch-thick patties. Cook patties in large nonstick skillet over medium-high heat or grill until done to preference.